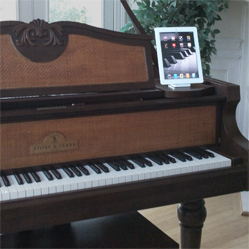 We can invisibly retrofit your Grand or Upright Acoustic piano and turn it into a New Generation instrument. 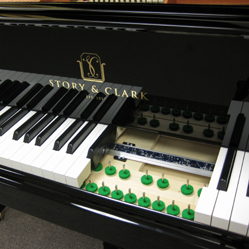 No Boxes – Aesthetics are a huge factor in the purchase decision of any piano. Old out of date technology hanging on your piano diminishes your pianos value. QRS has always offered a means of avoiding “The Box”. 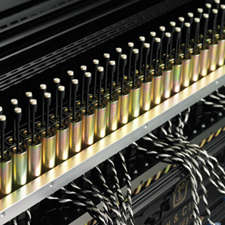 Now we have taken it a step further, full wireless control of the system. Integrated Record* – PNOscan integration gives you the possibility of networked lessons, performances and recordings. It provides position feedback of the keys movements, improving accuracy and performance. Integrated Sounds* – Perform, Practice, and Playback with MIDI sounds built in. WiFi enabled device – Interface is like a juke box in your hand, offers stealth updates, instant music purchases, and easy playlist creation. Music Now** – No internet is necessary, no iTunes is required. All music is available instantly when you want it, by the song, album, or collection. Easily customized playlists will deliver the perfect atmosphere. Full Control – Peace of mind that the software tools to enhance the PNOmation ‘s performance are in your hand. ** some copyright restrictions apply.